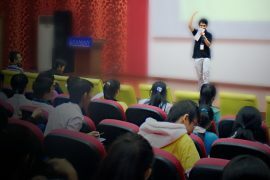 There have been times I blog about my impression on a particular place, especially when I attend international events. Last time, I talked about the beauty of a province of Republic of Korea, Daegu, during my days in ASEAN-Korea Cross-Cultural Exchange program. This occasion is special and different. 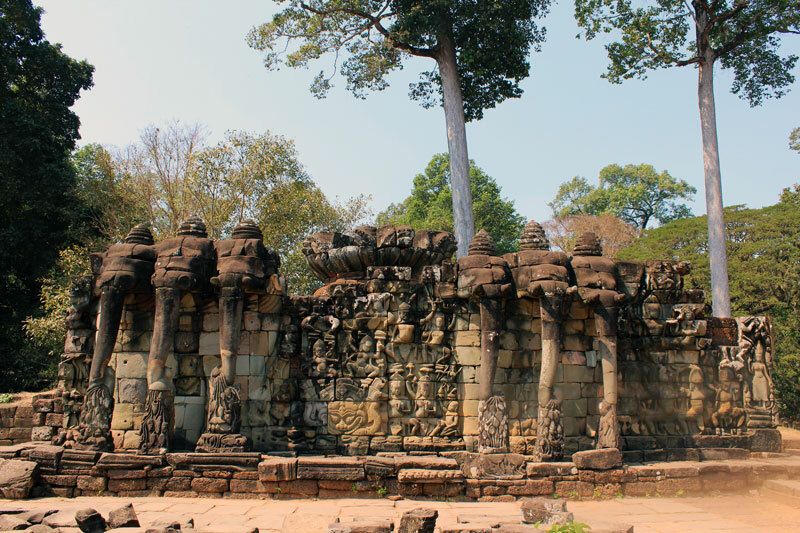 I am one of those blogger-participants in the BlogFest Asia 2012 hosted in my home country, Cambodia, and I am invited to join a blog competition whose topic is “Impression on Siem Reap”. 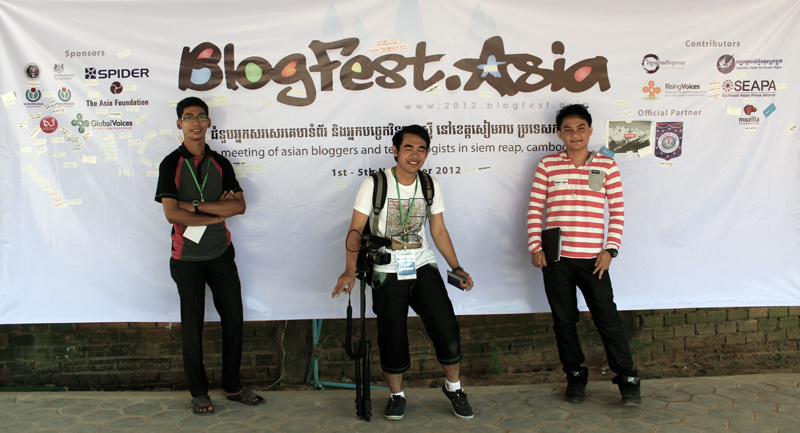 Theara, Chenda and Chetra (me) took a photo in front of the backdrop of BlogFest Asia 2012 held in Siem Reap. 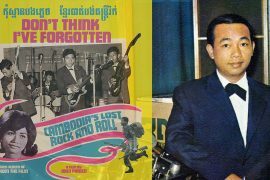 Again, the same “impression” genre is going to appear on my Khmer Scholar’s profile. It is special because this is a blogging competition, not just a mere hobby like before, and It is different because my impression this time is about where I come from, contradicting to past experiences where I blog about places in foreign countries. 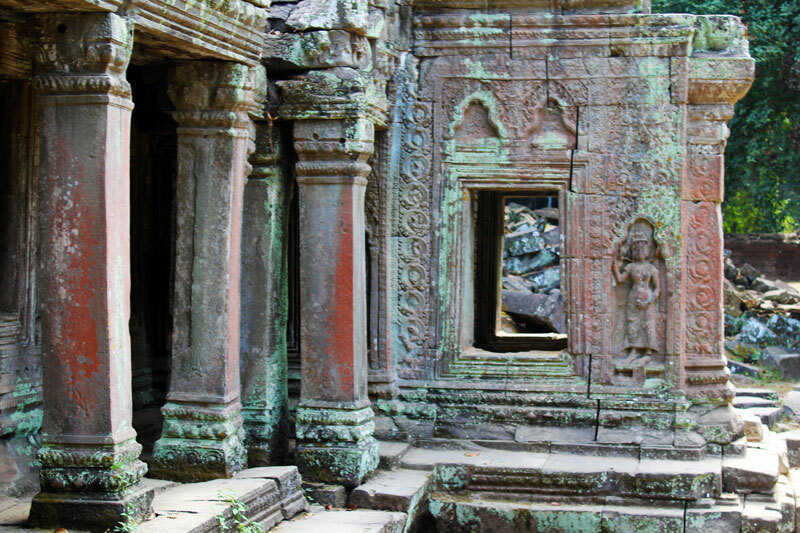 Since I am a local participant, I tend to look at Siem Reap from a comparative perspective, rather than the descriptive one. I am living in the capital Phnom Penh, the most urban cite in Cambodia generally known, yet from what I have seen in the past few days, Siem Reap is in many ways a better city than Phnom Penh. Chenda, Theara and Chetra (me) bicycled to Angkor Wat. 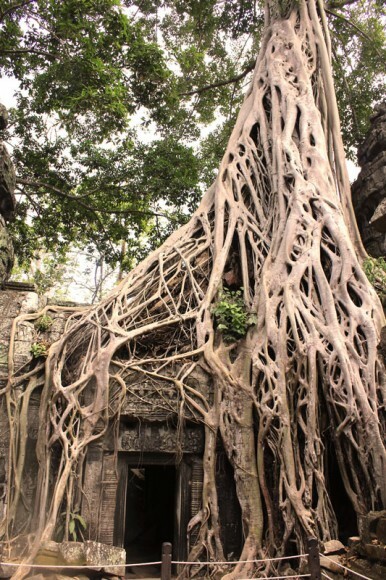 It’s around 6 kilometers from downtown Siem Reap to the Angkor compound. On the first day I arrived and started touring around, I was most impressed by how greener Siem Reap is compared to Phnom Penh. Using bicycles as our traveling mean of which we are proud, environmentally speaking, my two friends and I were discussing about the huge amount of care the local authority puts into making Siem Reap a clean place. Along the way, we constantly saw a bunch of people in green uniform, working to maintain a garbage-free landscape, and dirt-free roads. 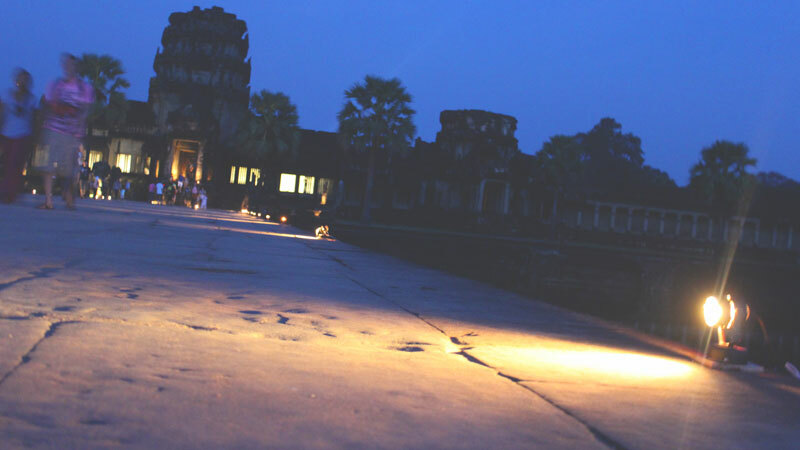 Probably, this extra care in Siem Reap is due to the highest status it holds in terms of tourism in the kingdom. Yes, we bicycled to places, but this was not due to the matter of convenience. 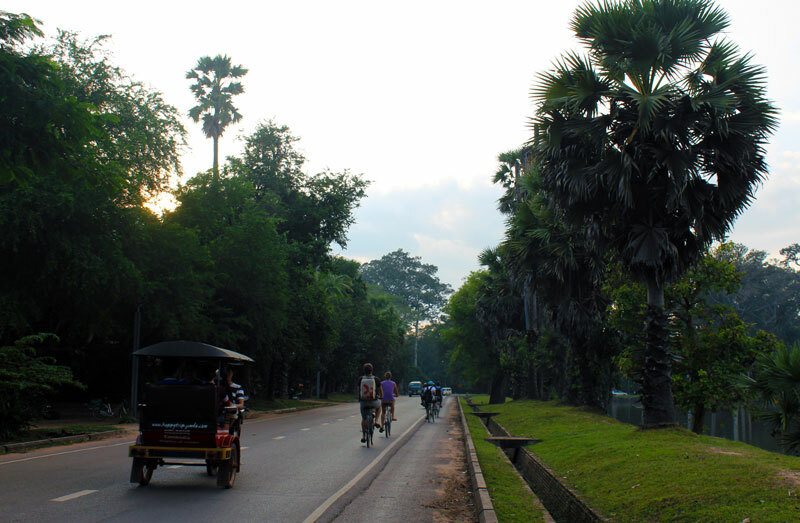 In fact, bicycling is sort of a traveling culture in Siem Reap as hundreds of guesthouses also offer bike rental service. I think it is the countless big trees that are responsible for fresh air and moderately cold weather, the smooth roads, and the good security that make bicycling fancy. Fortunately, this bicycling lifestyle actually contributes to eliminating traffic jam as well as being an alternative itself, reducing carbon footprints from fuel-powered vehicles. 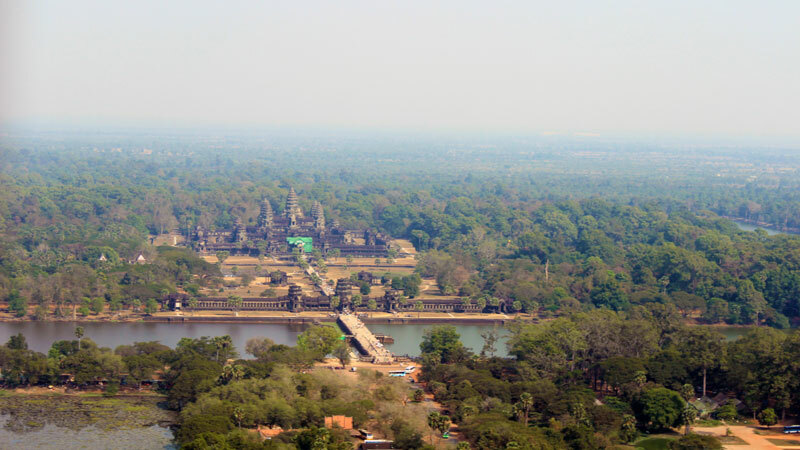 The last factor making me feel Siem Reap is greener than Phnom Penh is the popularity of recycling. I visited the night market and art center, and I excessively saw recycling products on sales, including bags, purses, trash cans, buckets, fashion accessories, souvenirs, etc. Theara, Chetra (me) and Chenda rent bikes from a guesthouse. 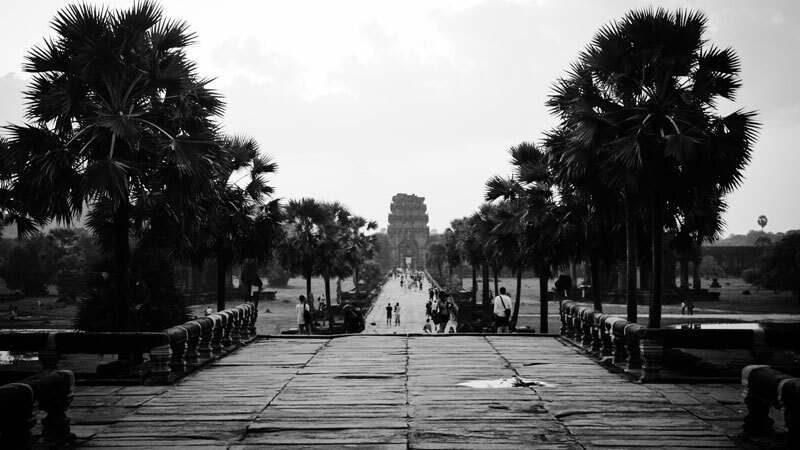 The next better thing Siem Reap has over Phnom Penh is lifestyle. 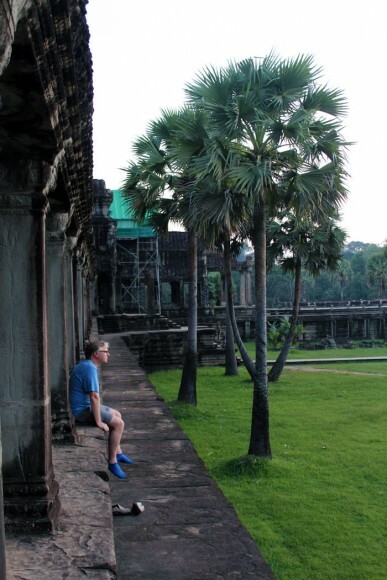 One of the same impressions my friends and I have is “Siem Reap is the land of non-local”. What we mean by the land of non-local is the fact there are literally 3,000 foreign tourists on an average day. 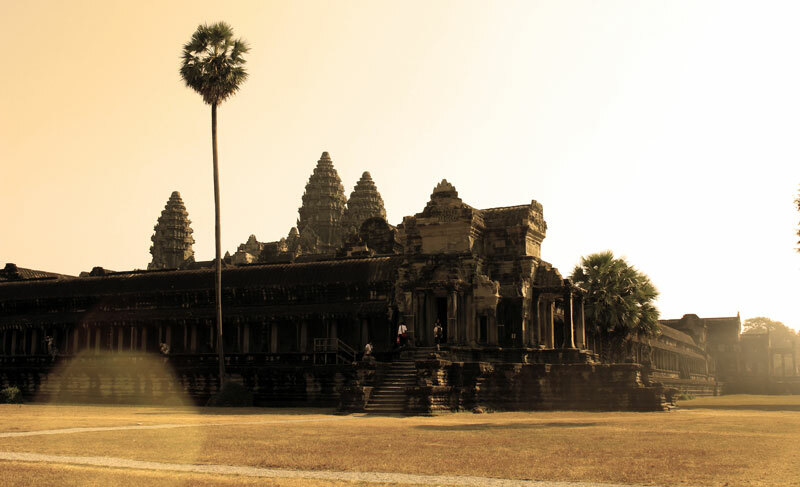 We think this amazingly huge amount of tourists significantly influences the lifestyle of such a small town as Siem Reap. There are businesses, from smallest to biggest, opened up to accommodate those tourists in almost all areas, such as food, hotel, refreshment, entertainment, travel, guide, shopping, and so on. The point is all these businesses are competing in offering their good products and services in the cheapest way they can. 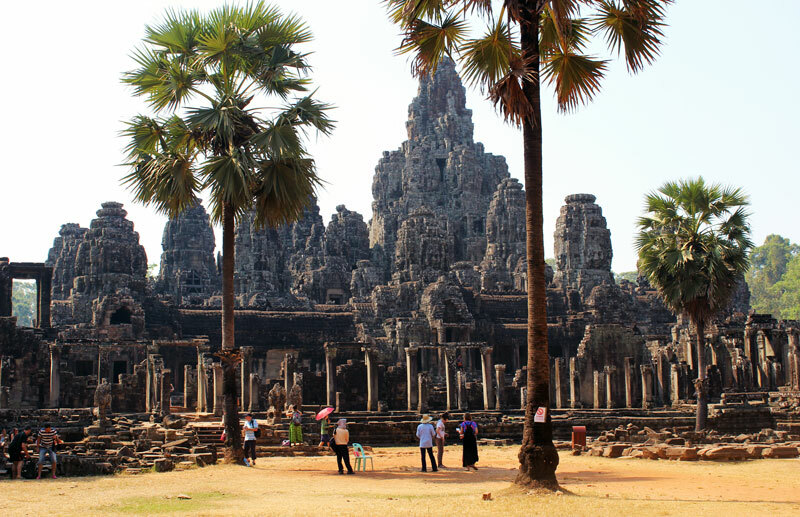 In this regard, the lifestyle in Siem Reap has become full of recreational facilities relatively cheap, at least cheaper than that in Phnom Penh. For instance, I spend $15 per day for a two-bed hotel room which also includes buffet breakfast, and well, good and tasty breakfast! Also, $1 would also get me a good meal of the day. On to the people in Siem Reap, my friends and I settled for one term “friendliness”. 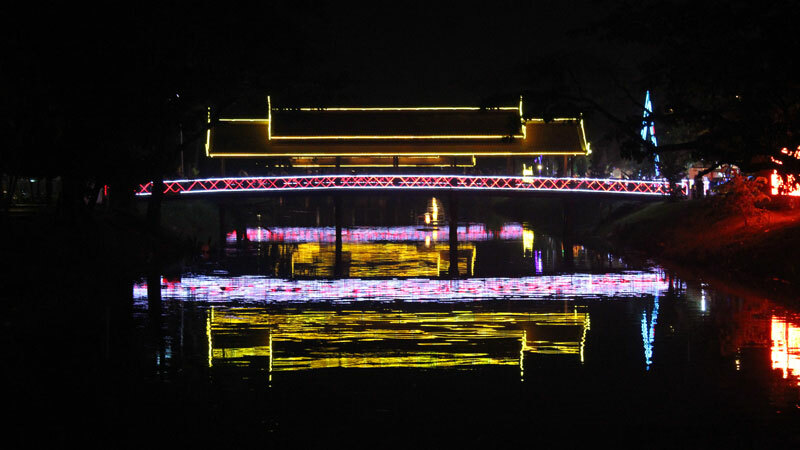 It is a tourist site, so it makes sense that people are mostly friendly. After all, no one would visit a place with unwelcoming people. In Phnom Penh, however, people are more aggressively business-oriented in our opinion. Finally, Siem Reap with its peaceful traffic as described above wins Phnom Penh in a landslide victory. 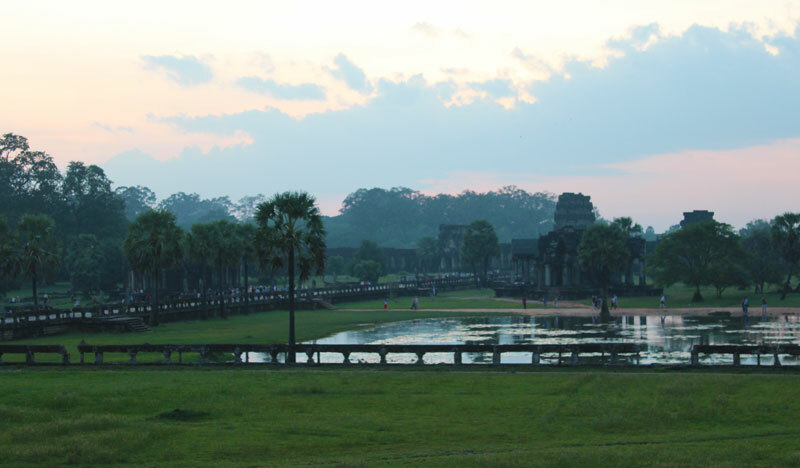 Siem Reap is definitely better than Phnom Penh in another big field, culture. It’s the center of Cambodian cultural exhibition. There are cultural legacies left from the ancient time such as temples, dances and performances, food, clothing, everyday tools, and the like. Artificial facilities created to promote Cambodian culture are also abundant – one of which is popularly known as the Cultural Village. 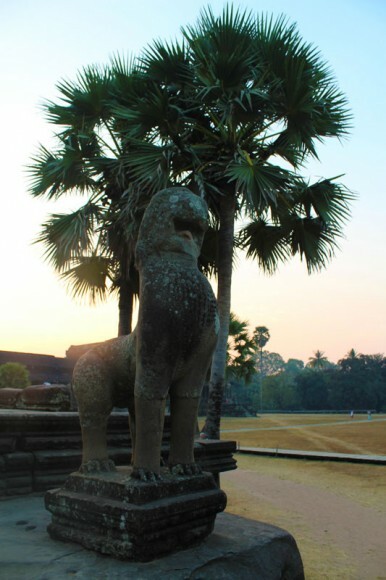 When my friends and I roamed around Siem Reap town, we were very deeply exposed to Cambodian culture. The decoration of hotels, restaurants, houses and most buildings appears to be deeply Cambodian aesthetics. Also, we often see tradition musical performances and dances in public areas, which is greatly entertaining and tone-setting, culture-wise. Everyone knows Phnom Penh is the capital of Cambodia, which means it is supposedly the most favorite cite. 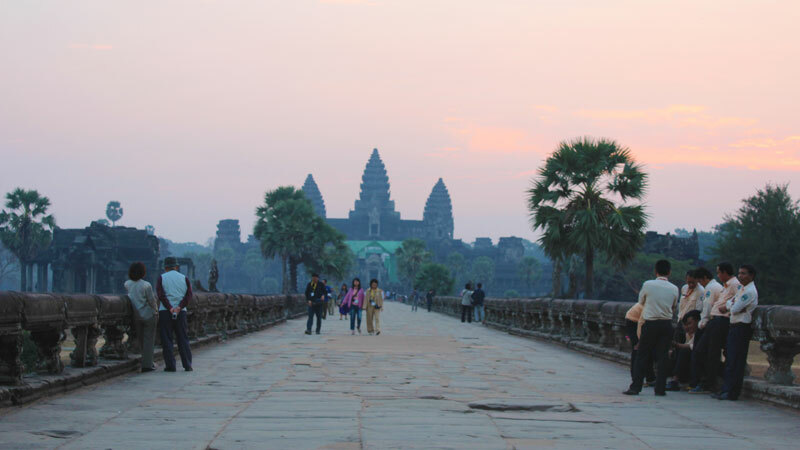 Yet, Siem Reap has all the urban qualities Phnom Penh acquires, and given its added values described above, the three of us are definitely convinced that it is a better Phnom Penh. 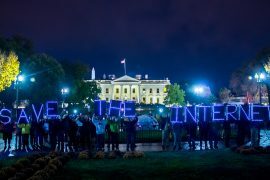 Great article with a pertinent analyze done by a brilliant young Cambodian, thanks for it!! Even if for me Phnom Penh is also a fantastic city, I’m really happy to live in Siem Reap and I would not change it for anywhere else in the world. Thanks for the insider tips- this really helps me plan my upcoming trip.